The real reason you can’t stay away from cookies, ice cream, pasta, soda, and candy. How to rescue your exhausted adrenals to stop the stress and the stress-eating. How your food choices are skewed by food intolerances and blood-sugar swings, and what to do about both. How to untangle the hype about Fats, Grains, Carbs, Meats, and Calories. For the more than two-thirds of Americans who are overweight, dieting is a failure. Where is America’s diet crisis hitting you? Beginning with her 8-Step Quick Symptom Questionnaire, author Julia Ross helps readers identify their diet and diet-caused imbalances and provides targeted strategies to correct those imbalances using nutritional supplements to jump-start the dietary overhaul. Readers can then end their low-calorie dieting and food obsessions for good. 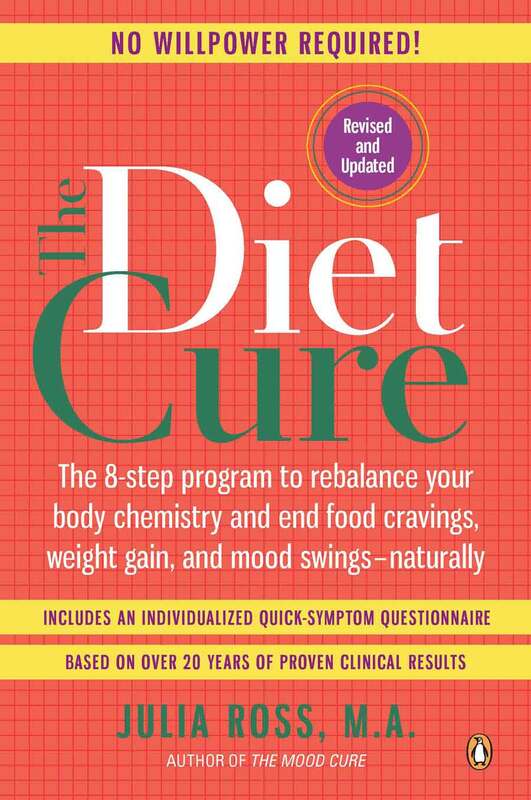 Reader Reviews: A few of the 200 reviews posted on Amazon for the new edition of The Diet Cure. A must-read for anyone who’s questioning their health! The Diet Cure changed my life! The Diet Cure will help you stop your eating urges and weight problems, and eliminate your mood swings and negative obsessions about your body. But first we have to determine what is causing these problems. The following is a short version of the questionnaires we use in our clinic. Need help customizing the suggestions found in Julia’s books? With tailored plans that nutritionally balance the brain’s appetite chemistry based on The Diet Cure and The Craving Cure, over 90% of Julia’s clients lose their cravings within a day.